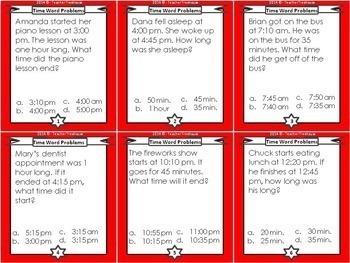 This set of task cards is designed to help your students determine start times, end times and elapsed time (duration) in word problems. Students will need to identify keywords in order to solve each problem. 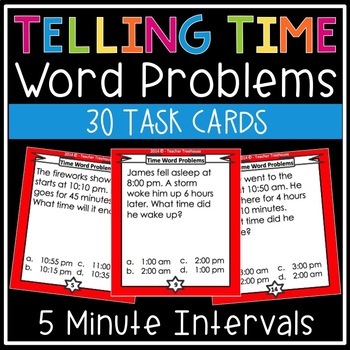 The word problems use times in 5 minute intervals, or "nearest 5 minutes." 4. Use for years to come! 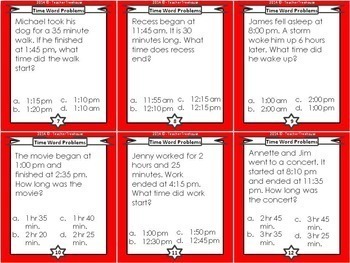 Prep: Tape these cards up on the walls throughout the classroom. Activity: Give each kid a copy of the student response sheet and have them quietly walk around the room. Explain that once they find a card, to sit quietly and solve the problem. Once the problem has been answered they can get up and look for another. Once they have answered all of the questions they will return to their seat (just make sure they have something to work on while the other students are finishing up). • Spring Multiplication Worksheet Packet - Just Print and Go! • EASY Rounding Method! Step by Step Posters & Worksheet Bundle - Quick Mastery!